Experienc The Elegance Of This Exotic And Classic Jukebox. The Rock-Ola Peacock Bubbler CD jukebox has all the same features as the original bubbler but has an added elegant and exotic peacock theme. 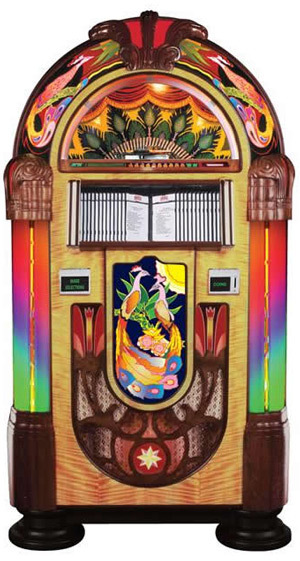 Many collectors consider the “Peacock” the most elegant jukebox of the series. The Peacock bubbler features a sparkling and colorful illuminated cabinet panel flanked by two additional bubble tubes in the lotus motif grille. Custom printed arch panels and molded wood crown and shoulders creat an exotic and luxurious allure.